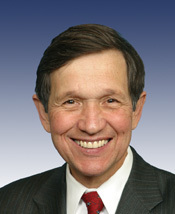 Dennis John Kucinich (born October 8, 1946) is an American politician who currently represents Ohio in the House of Representatives. He also sought nomination from the Democratic Party for the 2004 and 2008 Presidential election. He is married to Elizabeth Kucinich, née Harper. He obtained both his bachelor's and master's degrees at Case Western Reserve University, Ohio. Prior to his career in Congress, he was the mayor of Cleveland, Ohio from 1977 to 1979. This page was last modified 11:19, 9 June 2009.